Okay. So Patricia Kennealy (when I first read her books, that was her name) is obsessed with Jim Morrison, whom she claims to have "married in a handfast ceremony". 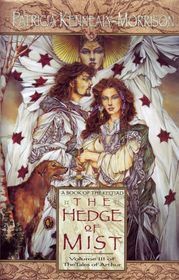 She started her writing career interestingly enough, with a trilogy called The Keltiad, basically pre-Christian "Celts in Space", mixing elements of all the different Celtic folklores (Irish, Scots, Welsh, Cornish, Manx, and Breton... I think that's it) with spaceflight and technology. The books are all sort of high fantasy with very one-dimensional Heroic! or Villainous! characters, whatever she tries to imply about the Light needing the Dark, blah blah hippie blah blah New Age pagan blah blah. But they're enjoyable -- The Copper Crown, The Throne of Scone, and the prequel one, The Silver Branch. Even the first one of the second planned trilogy, The Hawk's Gray Feather, which is her reworking of the Arthur legend and the Welsh bard Taliesin, is good. But after that... she goes downhill drastically, and swiftly. She writes one whole book which is just her fictional Keltic version of the great star-crossed love affair she claims with Morrison, and that's just grossly self-indulgent. And she misserves the opening of the whole imagined chronicle -- St. Brendan's exodus from Ireland as the Christians (and St. Patrick) arrive -- by writing it as flatly and Heroically! versus Villainously! as possible. Ugh. I can't even bring myself to reread those two, Blackmantle and The Deer's Cry. She had intended a third trilogy to cap the original Keltiad "Tales of Aeron" -- to be about Aeron's companion, Gwydion. But she hasn't done it. She's been more involved in writing a biography of her love affair with Morrison, and in trying to become heir to his estate, or something like that. Frankly, I don't remember whether she sued the estate or was just blocked from publishing love letters, or what. But it's sort of creepy to see. I wish she hadn't gone down that road. This is the final book in the "Arthur" trilogy. I admit that I try to read any version of the Arthurian legends that comes across my path, but I think that this is one of the better ones. Keneally-Morrison describes it in her afterword as a consolidation and lists out the impressive number and range of books she has referenced in writing it. It is as original as it can be, the original Earth based stories becoming prophecies of a far future. This third book ties up the loose ends and brings us a thrilling grail quest, a moving death of Arthur and the setting up of the "once and future king" with lots of magic, spaceships and bardery. The characters are always interesting, and there are lots of them and the writing is good. The story is very moving in places and it held my interest throughout. If you are an Arthur buff then I recommend this very highly. I started reading this book 18 years ago and got sidetracked. I finally finished it this week. The ending dragged after Arthur and most of the crew of the Prydwen die on the planet of the Salamandri.